Like many coffee-growing nations, Colombia isn’t known for having top-quality roasters. But times are changing, and as Juan Valdez increasingly competes with Starbucks across the globe, there’s also a growing number of small and medium-scale roasters popping up across the South American country. Dedicated to producing the highest quality drink possible, these roaster-cafés like Stumptown in the U.S. or Koppi in Europe are frequently referred to as the Third Wave of coffee. (The first wave being the mass arrival of coffee in the home, and the second being improved coffee like Starbucks). One Bogota café that’s popular with people working in the financial district is Devoción, decorated like a Parisian bistro and serving coffees from different Colombian regions, prepared using methods including dripper, French press and siphon. 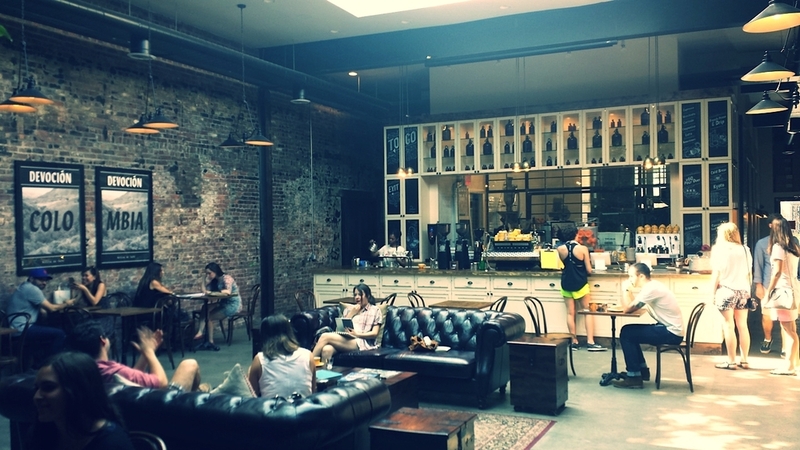 Recently Devoción opened a second café in Brooklyn, New York. We met with owner Steven Sutton there and asked what makes his company different. Sutton says Devoción buys directly from about 400 farmers across Colombia, as opposed to coffee cooperatives, helping to guarantee the quality of the beans. The dried coffee is then taken to his mill in Bogota and once the layer of parchment is removed, the green coffee is roasted within 10 days. To ensure this is possible at the Brooklyn branch, green coffee is sent from Colombia to the U.S. via Fedex, rather than the normal shipping process which can take several months. And unlike other cafés that roast and serve coffee from various different countries, Devoción only uses Colombian beans, enabling Sutton to become an expert in the country’s numerous ‘terroirs’. He calls this specialization in the coffees from one country the Fourth Wave.